This means the breakdown of tissue to form pus. 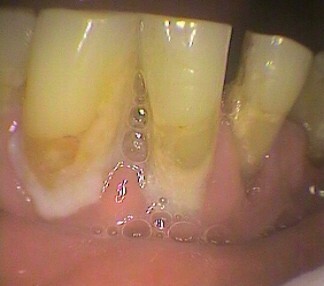 A gum abscess is a very quick loss of bone and attachment with swelling and pus observed. This is not good and drainage and antibiotics are needed. The dentist has to make sure the origin of the pus is determined. Is it coming from outside the tooth or from within the tooth’s root canal? 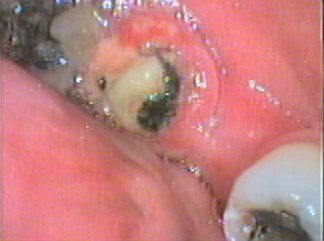 Is it within the soft tissue from elsewhere in the body, such as impacted wisdom tooth, or another type of infection? Or is it even coming from another tooth? This is to record the presence of bacteria and the sticky mass it creates with saliva that has not calcified to form calculus or tartar. It is an indication of oral hygiene and care. The more the plaque build-up is on the tooth, the greater the amount of bacteria that can cause decay and gum problems. This sticky mass of bacteria eventually forms calculus or tartar. It also indicates where the patient is not cleaning their teeth. They may be a mouth breather which dries their saliva and increases plaque formation, especially on the front of their upper front teeth. Plaque is also a wonderful source of bad breath! 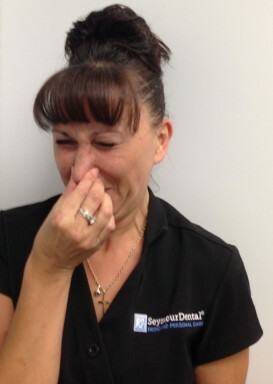 Supparation - pus formation in the gums Large amount of plaque near gum	 Roni NOT liking bad breath!